Parrots - Tropical Birds - Metal Wall Art, Metal Art Birds - Hand Painted Metal - Tropical Home & Garden Decor - Haitian Metal Art - Recycled Steel Drum Art > Scarlet Macaw - Hand Painted Metal Art Parrot Wall Hanging - Tropical Decor - 26" x 18"
Beautifully hand painted metal parrot wall art. Hand cut from recycled steel drum in Haiti in to the shape of the parrot. 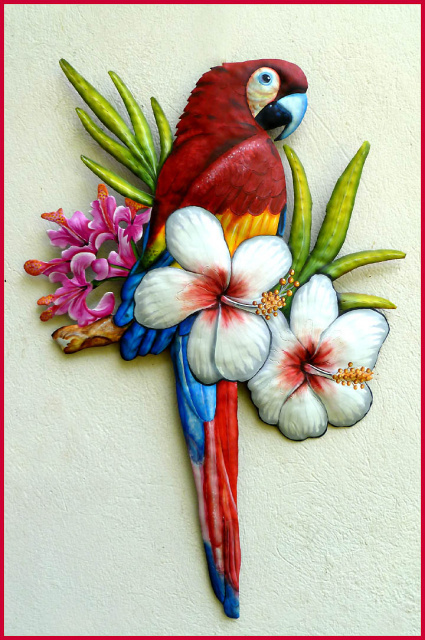 Scarlet Macaw metal art wall hanging measures 26" x 18" .